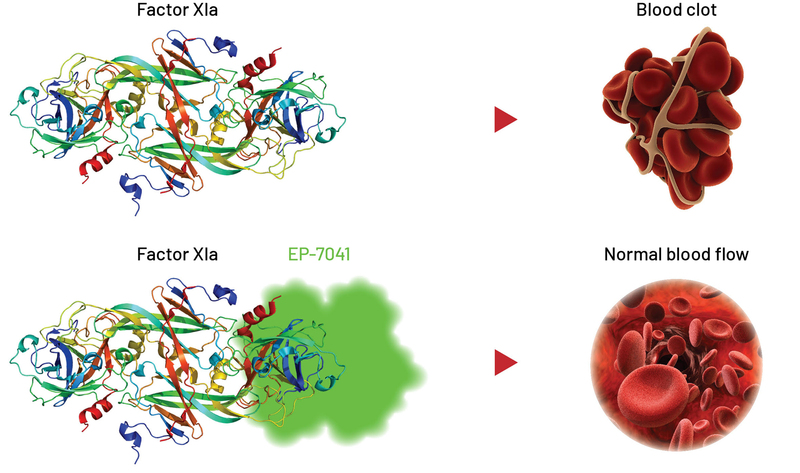 eXIthera is developing novel, potent and selective small molecule Factor XIa inhibitors designed to prevent thrombosis with limited risk for bleeding side effects and without the need for a reversal agent. These pathways merge to form the “common pathway” that leads to fibrin formation and/or platelet aggregation. Anticoagulants used to treat or prevent thromboembolism are some of the most commonly prescribed therapeutics. 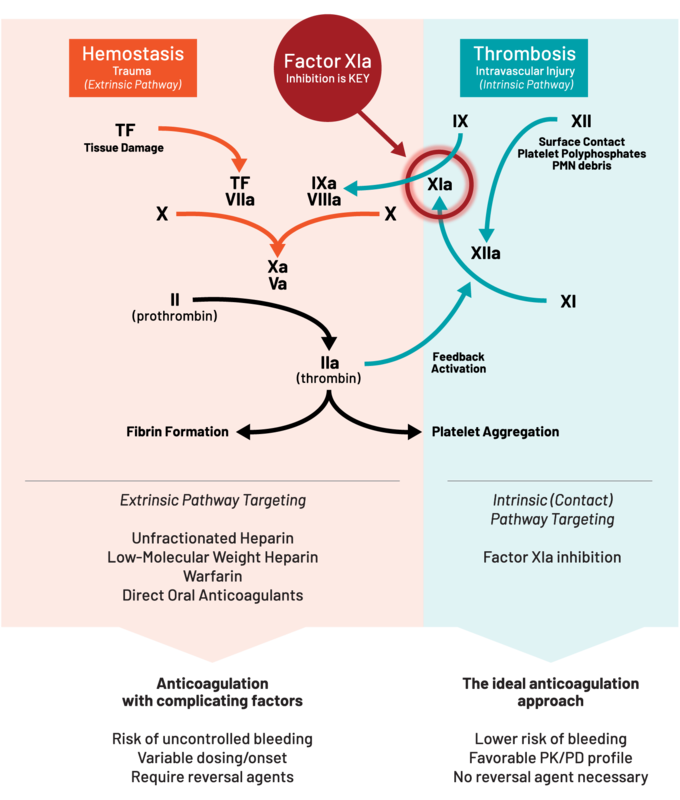 However, all currently available anti-thrombotics have limited discrimination between the intrinsic and extrinsic pathways, resulting in undesired impairment of normal hemostasis. These anticoagulants can cause abnormal clot formation that could lead to bleeding and delay vessel repair putting patients on anticoagulants at significant risk of serious bleeding. Recent epidemiological data and work with animal models suggest that Factor XIa plays a unique role in thrombosis and hemostasis. In one study, patients with plasma Factor XI levels in the top 10% of the normal range were nearly twice as likely to develop venous thromboembolism as everyone else in the study population1. Later studies associated high plasma Factor XI levels with increased incidences of myocardial infarction and stroke2,3. In contrast, Factor XI deficient individuals exhibited remarkable antithrombosis activity with an eight-fold reduction in ischemic stroke and reduction in venous thrombosis4, 5. Importantly, these patients presented little or no bleeding liabilities in spite of their deficiency. eXIthera’s clinical candidates have the potential to address the need for an effective anticoagulant without serious bleeding side effects and offer complementary options for both the hospital and out-patient setting. 1. Meijers JC et al. (2000) High levels of coagulation factor XI as a risk factor for venous thrombosis. N. Eng. J. Med. 342: 696-701. 2. Doggen CJ et al. (2006) Levels of intrinsic coagulation factors and the risk of myocardial infarction among men: opposite and synergistic effects of factors XI and XII. Blood 108: 4045-4051. 3. Yang DT et al. (2006) Elevated factor XI activity levels are associated with an increased odds ratio for cerebrovascular events. Am J. Clin. Pathol. 126: 411-415. 4. Salomon O et al. (2008) Reduced incidence of ischemic stroke in patients with severe factor XI deficiency. Blood 111:4113-4117. 5. Salomon O et al. (2011) Patients with severe factor XI deficiency have a reduced incidence of deep-vein thrombosis. Thromb. Haemost. 105: 269-273. EP-7041 was found to be safe and well tolerated in healthy volunteers following single or multiple ascending doses in a recent Phase 1 clinical study. In addition, the pharmacokinetic and pharmacodynamic profile indicated desired efficacy with minimal potential for bleeding.